Fresh thinking is the answer to today’s challenges. Tough times need unexpected tough performance. A new understanding of farming enabled by a global player. A future-oriented portfolio doesn’t end with tractors. 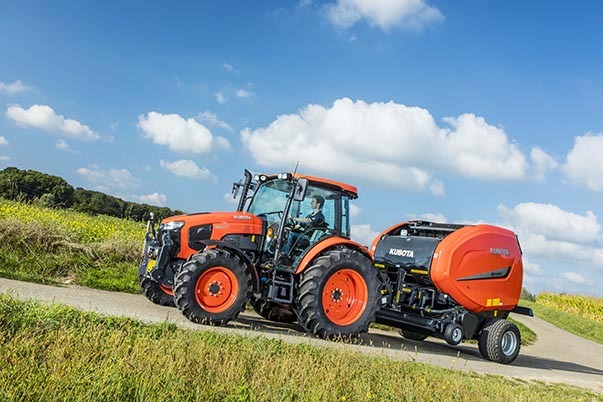 Kubota M5001 is your smartest choice– the extremely manœuvrable tractor proves that size doesn’t matter. Its powerful engine, excellent transmission, high ground clearance and easy control makes the M5001 series essential in your daily work. Tough jobs are made easy ! Surprisingly powerful: The 95 and 113 hp (DIN 97/68 EC) 4-cylinder-engines will show their power and efficiency. Environmental friendly: The strict Stage 4 –final emission regulations are passed with flying colors. Extremely maneuverable: The Bi-Speed-technology with 55° turning ankle and high ground clearance makes the M5 extremely agile and manœuvrable. Very comfortable: With 36 forward and backward gears, changing gears is easy. Surprisingly big: The spacious & comfortable cabine gives the operator a perfect 360 degree visibility, while the controls in the cabin keep everything under control. Precise: The M5001 is much more than just a tractor. With ISOBUS retrofit terminals and Kubota implements this beats all challenges. 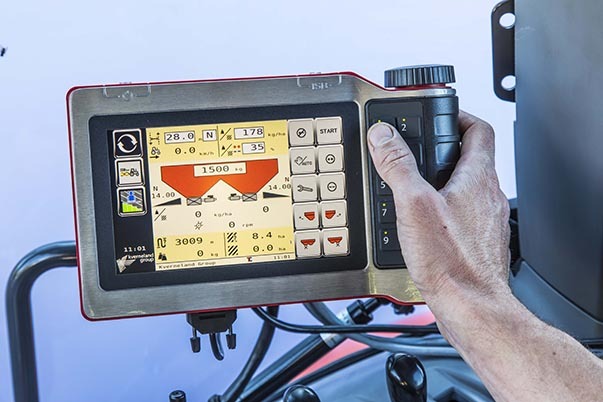 Save time and money with the possibility of precision farming solutions. Kubota M5001 is designed for tasks which demand excellent manoeuvrability as well as the demanding operation of PTO-driven implements. 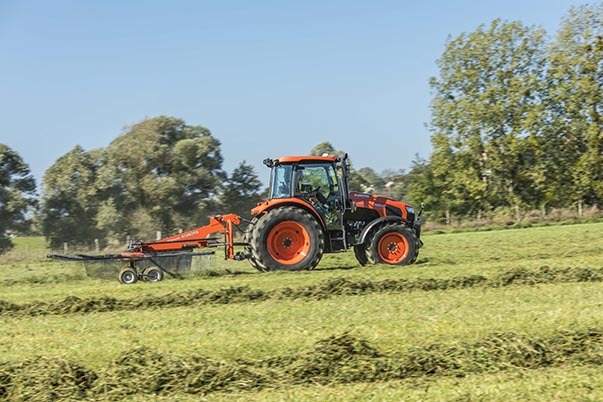 Thanks to Kubota’s renound diesel engine technology, the M5001 can handle tasks with ease whilst being environmentally friendly. Powerful, reliable, clean, and quiet—the V3800 four-cylinder engines in the two M5001 series models M5091 and M5111 impress with their, reliable performance. Our combination makes the difference! The common rail system (CRS) optimises combustion, resulting in a long-lasting engine and a quiet one. 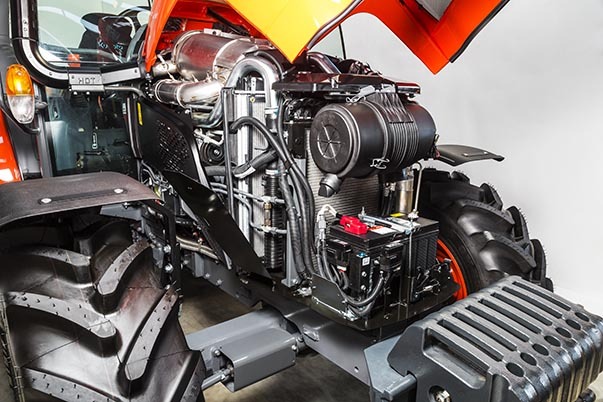 Kubota is the first tractor manufacturer to use a common rail injection system together with an SCR catalytic converter, AdBlue®, water-cooled exhaust gas recirculation (EGR), diesel particulate filter (DPF) and diesel oxidation catalytic converter (DOC). The combination of this market-leading technology produces excellent performance values with optimised fuel efficiency. The V3800, 16 valve engine also meets the strict requirements of the latest Euro Stage IV emission standards. The engines also feature a new electronic speed controller to manage engines speed. Once the system has been activated, the speed remains constant, regardless of the power needed. PTO-driven implements can therefore be run more efficiently. With recurrent PTO driven jobs, you can recall each setting just thanks to the touch of a button. The user-friendly transmission of the M5001 provides a very smooth and easy gear change. The 36 forward and reverse gears, can adapt to all your needs : from field and pasture work to vegetable plots. With 6 synchronised gears and Dual speed technology in three ranges, you have 36 forward and reverse gears to choose from. The transmission lets you change gears directly and extremely smoothly. The drive clutch can be operated very precisely for coupling machinery. For such slow manoeuvers, you can use the clutch pedal to control a hydraulic valve that engages the clutch smoothly and precisely. This will give you easier operation that is less strenuous. Drive fast and save fuel at the same time. 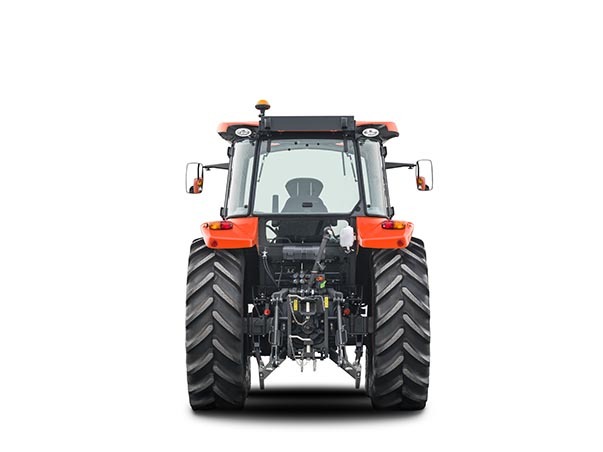 The tractor’s transmission cruising gear keeps the engine speed low thanks to the overdrive technology for high-speed trips. This 40-ECO transmission gets you to your destination quickly and saves fuel at the same time. With the electrohydraulic shuttle lever, you can change direction faster and easier than ever, without having to use the clutch. Just move the hydro shuttle briefly forward and backwards. The hydraulic power and lift capacity of the M5001 can easily lift a combination of front and rear disc mower. The strong 3-point category II power lift allows the M5001 to easily raise heavy attachments. Various machines can be quickly and easily attached and removed. Thanks to the powerful 3-point lift, you can handle even the most challenging tasks with ease. External hydraulics of the M5001 are extremely powerful, respond quickly, are easy to maintain, and increase the lift capacity. The hydraulic pump has the capacity to guarantee both rapid and effective front loader operation, improving productivity and performance. The standard equipment includes two control valves and an additional hydraulic valve with or without the flow control options. The hitch control system of the M5001 allow optimal use of rear accessories. The position control, manages the attached equipment independently of the required tractive power. The draft control also regulates the tractive power required for the machine and automatically reacts to different soil conditions in order to maintain constant traction. Both control methods can also be used together in the draft mix. Whether you are cutting grass, baling or spraying, you can always count on the independent PTO shaft at 540 rpm or 540 Eco rpm, anywhere and time. The PTO shaft brake engages automatically when the PTO shaft is disengaged, bringing the implements to a safe standstill. The PTO shaft clutch can be engaged and disengaged, electro-hydraulically while working. 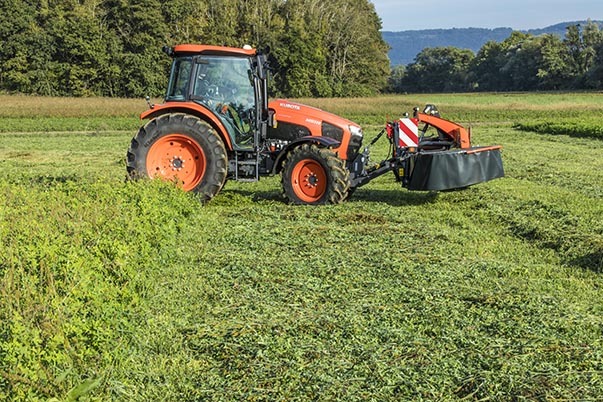 This makes tasks such as mowing or haymaking even more efficient. The tractor can also be equipped with a 1000 PTO shaft if requested. 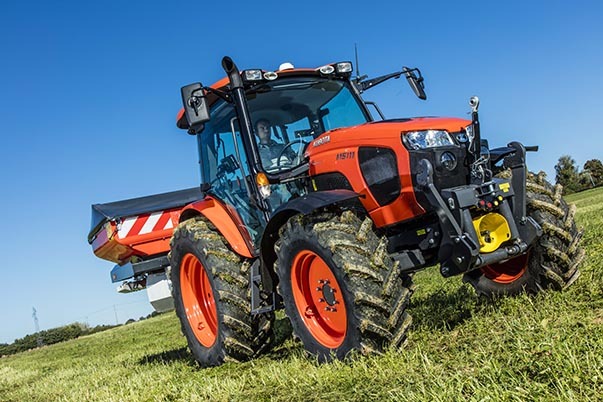 The Ultra Grand Cab II from the Kubota M5001 range, offers more space than any other tractor in its sector. The comfortable cab is not only spacious, it also guarantees a pleasant environment, including excellent panoramic visibility. 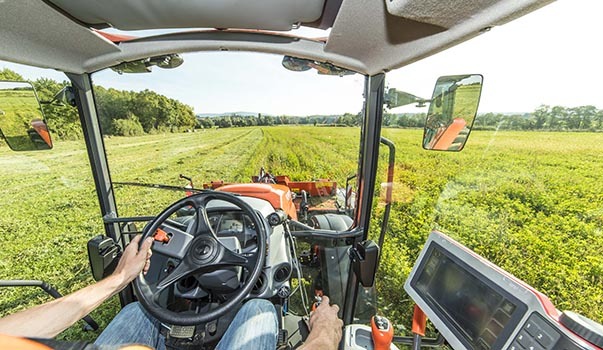 Kubota knows that the cab is your mobile office for most of the day. This is why this machine has been designed to help you perform your tasks with comfort and efficiency. Air conditioning and a tinted skylight window, are just one of the examples. Convenience and comfort begins with the doors. The large, glass doors of the M5001 open wide and ensure safe and easy entrance and exit on both sides. This is ideal when you are on and off the tractor a lot. The platform and perfectly positioned pedals also provide generous headroom and legroom. Very few cabs in this class provide such excellent direct visibility of your working environment. 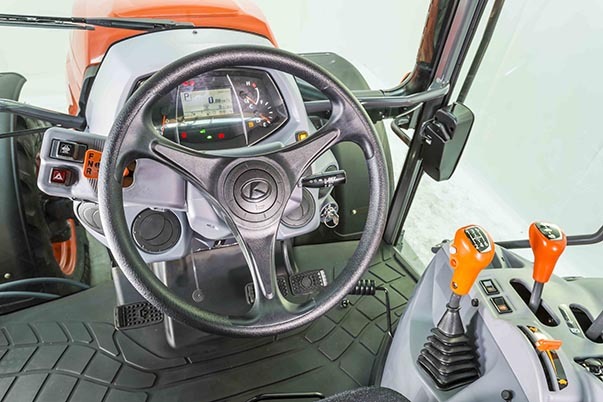 Kubota has equipped the cab with curved glass. Not only does this produce less glare, but the glass also provides a feeling of spaciousness. Narrow cab pillars, and the well designed bonnet all contribute to this, as does the exhaust pipe positioned at the side of the cab. Thanks to the glass doors, you also have a very good front view. Plenty of passenger space There is also a comfortable spot reserved for an instructor as an optional seat. If the seat is not needed, it can be folded down for even more space. The comfortable driver’s seat and sophisticated cab air conditioning system provides the best conditions for long, hours on the tractor. The standard air conditioning and heating system located underneath the driver’s seat keeps you cool in the Summer, and warm in the Winter. The curved glass and intelligently positioned air nozzles on the steering column circulates the air perfectly throughout the cab. Your Kubota dealer can also install an optional electric defogger kit. This gives you a clear rear view even in rough weather conditions. The convenience offered by the Ultra Grand Cab II is on a par with the excellent visibility. 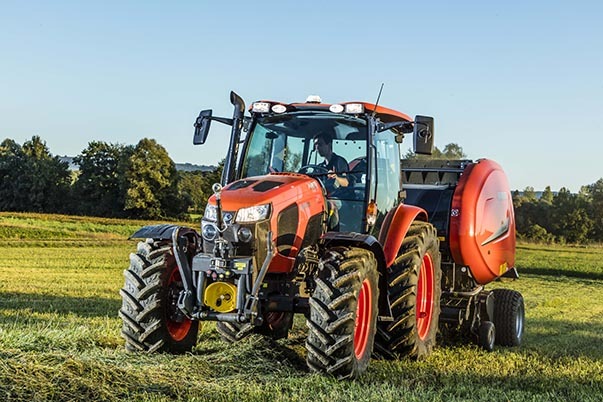 The comfortable driver’s seat and sophisticated cab air conditioning system provide the best conditions for long, pleasant hours on the tractor. See for yourself! You’re cordially invited to a long, relaxed work day. 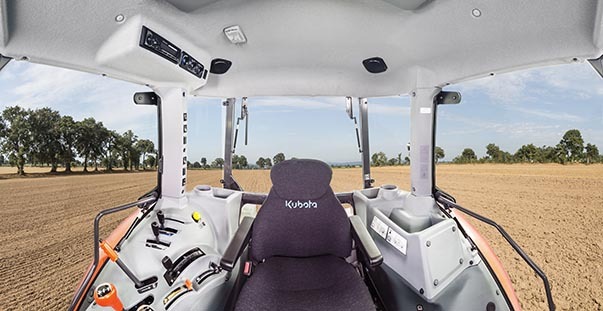 Kubota redesigned the cab to adapt it to everyday use. Almost all central control elements are located on the right-hand side next to the driver’s seat. This allows you to control the attachments with precision and perform loading work with greater ease, while having to move around less. The control elements in the cab ceiling are also easy to reach. The instrument panel is clearly laid out. Easy to read and with the same design as its precessors—the Kubota M7001and MGX III—all of the important operating data is available to you in an instant. With the retrofit ISOBUS and Precision Farming solutions for the M5001, you can apply pesticides, fertilizers, and seeds in an efficient, precise, and cheap way. The tractor and productive resources are put to optimal use. Retrofit kits can be added, which means that your M5001 becomes an ISOBUS tractor with which you can use any ISOBUS device. The terminals are ISOBUS-certified. The connector makes it possible to display the ISOBUS devices in the cab on the IsoMatch Tellus 12-inch or IsoMatch Tellus Go 7-inch monitor. All device settings can be accessed via the touchscreen display from your seat, and you can adjust the monitors to your liking. The two operating terminals are certified according to ISO 11783. Up to four cameras can be displayed on one monitor. Short cut switches that allow fast and easy switching between screens are also available. 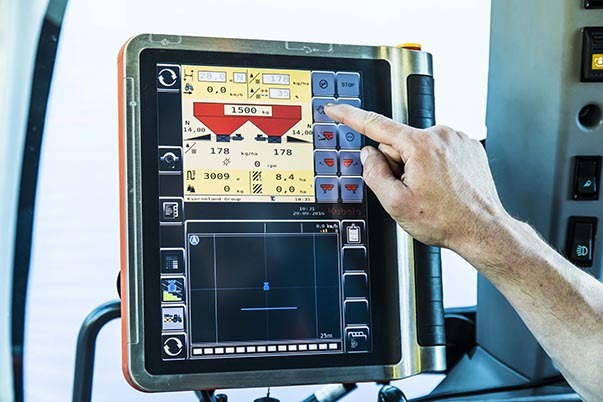 The IsoMatch Tellus 12” has two different screens displayed at the same time, this means two different types of information or two different ISOBUS machines. In addition of the ISOBUS terminals, a steering LED bar can be used to allow the driver to do manual guidance and increase the precision of the M5001. The GEOcontrol function included in the Kubota terminals, in combination with GNSS receiver allow you to use the section control application and/or the variable rate function. These functions can be used with ISOBUS implements for example the precision seeders, spreaders or sprayers. These functions save costs and resources by saving: time, overlaps, fertilizer, and seeds. All jobs with the terminals can be exported to offer perfect traceability. M5001 added the the LA1854 allow the perfect match between the tractor and front loader for your own farm. Both are from the same source – Kubota. The bonnet provides a great visibility towards the front loader or front implement. This ensures overview and safety during your work. The anti-lowering valves let the front loader maintain its position even in case of lost hydraulic pressure. Whether you need to work with a manure fork, pallet fork, bale fork, or a bucket— each of them can be quickly attached and removed from the M-series front loader. The standard Euro quick coupling is used wherever tools with Euro mounts are attached, heavy loads are handled, and high lift capacity is required. With the optional Kubota quick coupler, you can connect all four or six hydraulic lines at once and disconnect them just as easily. The KSR (Kubota Shockless Ride) vibration damping system substantially minimises the shocks experienced by the driver, which can occur when working on bumpy terrain or during long-distance transport trips. This function can be adjusted or switched on and off using the control below the KSR valve. You can easily control the front loader with the easy-to-reach joystick on the right-hand side panel of the M5001. 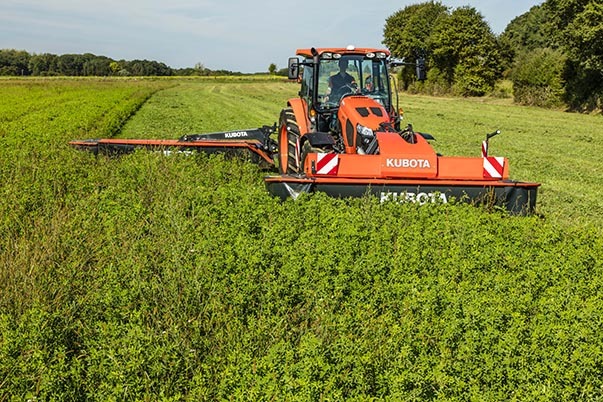 In terms of manoeuvrability, the Kubota M5001 is in a class of its own. You can see this as soon as its in tight spots.Traction and ground clearance are also excellent ! The front axle with bevel gear drive makes it extremely manoeuvrable, featuring a terrific 55° steering angle, perfect for tight quarters. For over 30 years, Kubota has been using front axles with bevel gear drives. This combination is not only responsible for the very tight turning radius, but also allows for the elimination of the high-maintenance universal joints. Slippage is controlled during turns. When used on difficult terrain, you can additionally also use the rear differential lock. All M5001 are equipped with dual brake lines to ensure a great performance in difficult circumstances such as heavy trailer for example. The M5001 is also equipped with multi-disc brakes running in an oil bath. They require less pedal force, which in turn makes your life easier. Even under recurring tough working conditions, they retain their high performance and braking power. Engage and disengage the four wheel drive simply by pressing a button. The best part of it is that the tractor doesn’t have to be stopped, even when transitioning from the field to the road. Productivity is increased, and an LED indicator displays the current status. When the brake is pressed, four wheel drive is automatically engaged for better braking power.